There are also some who say there is no point in demonstrations. I humbly disagree. People often make the mistake of discounting the value of symbolism, community building and process. Revolutions are not televised: we only see the flashpoints. Not all change is cold, hard, immediate and quantifiable. Neither is it mutually exclusive with other forms of action. There has been a growing hive of (mostly young) Ghanaians online, actively discussing real politics, and moving away from uncritical affiliation to any single party. Besides groups like Blogging Ghana, GhanaDecides, InformGhana, and GhanaThink, there are bloggers/tweeters like Jemila Abdulai, Malaka Grant, Amma Aboagye, Nii Aryetey Aryeh, Edward Tagoe, Nyamewaa, Kajsa Hallberg Adu, Nana Yaw Asiedu, Abena Serwaa, Dr. Esi Ansah, Ato Kwamena Dadzie, Dr. Lloyd Amoah, Soraya, and many, many more. 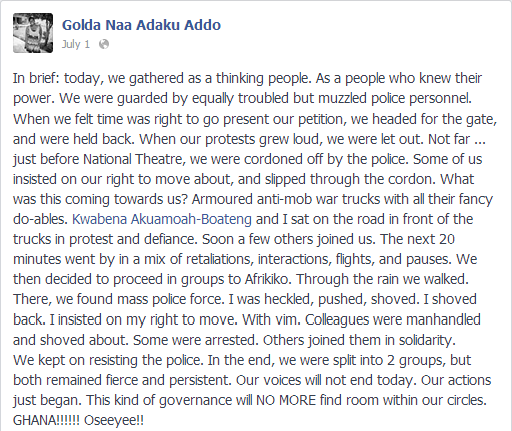 One particularly memorable gathering of non-partisans was at Golda Addo‘s ‘One Simple Step’, where I remember Kuukuwa Manful standing up to a government official to explain that many Ghanaians actually want to understand and help, but are frustrated because government is not open enough about the extent and depth of the nation’s problems. The Ghanaian government position is often ‘Don’t worry. You don’t know what is really going on: let us do our job’. Which works when (a) you are doing your job and (b) you are able to effectively communicate to everyone the extent to which you are doing so. Sadly, it seems like at least one of those things is not happening. The cancellation of the proposed ‘One Thousand Man March‘ in support of President Mahama is the one smart thing I think the authorities have done in this entire PR debacle. While there is nothing to officially link it to government, the event certainly smelled like a knee-jerk counter-propaganda response to what was (and is unfortunately still) thought of as NPP mischief. How depressing is it that we have sunk so deep into apathy that some find it hard to believe that ordinary Ghanaians are capable of any kind of political engagement beyond the NDC/NPP binary. Only in such an environment can engaged citizenship get confused with ‘political mischief’ and blind loyalty to leadership get confused with patriotism. The fact of the matter is that politics is not about political parties. It is about the People and our concerns. I heard many people say yesterday that all Mahama had to do is come out and speak to the people, and it would have completely calmed things down. Meet the protesters. Take the petition. Say something leaderly. Instead, he sent a small army of bulletproofed-up police and water canons. Some were even in riot gear. 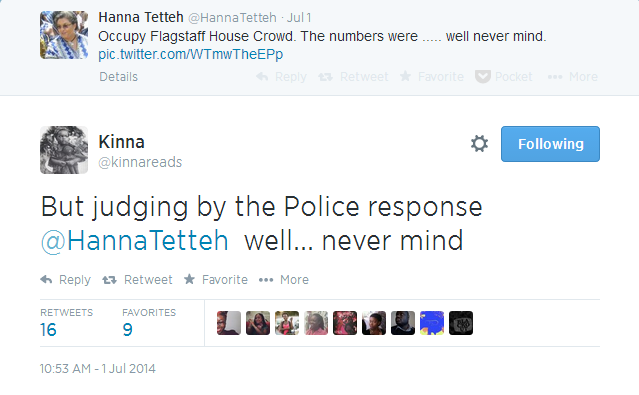 Hanna Tetteh’s relief at the relatively low numbers yesterday was so palpable that it took the form of a tweet. They brought out water cannons, for goodness sake. I’m glad they didn’t use them, but only because I did not bring buckets and barrels to fetch the water that has not been flowing through my pipes (hello Adenta/Ashiyie). It’s depressing when a government feels it needs protection from its own people. Contrast this with back in the day when it was The People who rescued President Kufuor from his limosine when he had a car accident. Not his (frankly pointless) security detail. I have haaaardcore NPP friends who told me (in the late President Mills’ time) that the only way they would ever dream of voting NDC is if Mahama was its presidential candidate. There was a lot to like. Beyond the charm and experience, he was the closest we would have for awhile to a ‘youth president’; our first President to have been born in Ghana, rather than Gold Coast. He symbolized something. He has a capable team too. When she is not making unfortunate comments on Twitter, Hanna Tetteh is generally regarded as an impressive, efficient minister. I once worked for Dr. Raymond Atuguba and if the man decided to run for President, I would give serious consideration to quitting my job at Ashesi and volunteering for his team. Seriously. For all the knocking he takes, Vice President Amissah-Arthur is someone I know (he’s my step uncle) and admire personally, and have done for years. The man turned down the role of Minister of Finance when Mills offered it to him, and had to be begged to become Bank of Ghana governor. Mahama really earned my respect when – in spite of popular disapproval – he chose Nana Oye Lithur as his Minister for Gender, Women and Social Protection. Seeing him stand by his decision instead of backing down to the mob demonstrated real leadership, if you ask me. So where did it all go wrong? What happened to the great communicator (with a degree to prove it) who wrote an autobiography? The man who reads his speeches from an iPad? I’m hearing the government churn out macroeconomic arguments about Ghana doing well. When you see the working class in agreement with the middle class and with international agencies, something is clearly up. Maybe we’re wrong. I doubt it, but maybe all those angry people at the protest were wrong. If so however, then I humbly entreat the President’s team to do a better job of communicating their achievements, rather than spending energy on patronizing (and out of touch with reality) counter-propaganda. Sitting there thinking that the reason popular opinion is not in your favor is because of NPP manipulation underestimates the intelligence of the people (which is – ironically – a habit I associate with the NPP). Our democracy is growing and deepening. 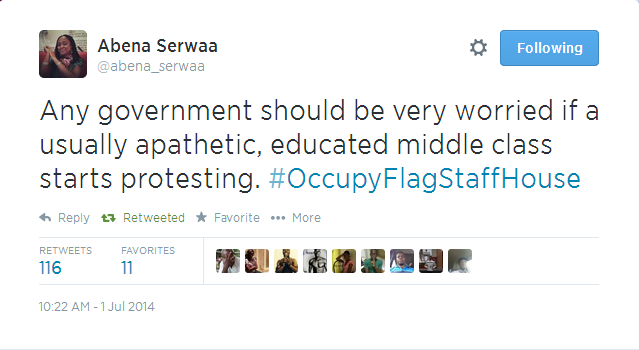 Ghanaians are getting smarter. Know this. Whoever is controlling the propaganda needs to start moving beyond NDC vs. NPP tactics. Because – slowly but surely – everyone else is. 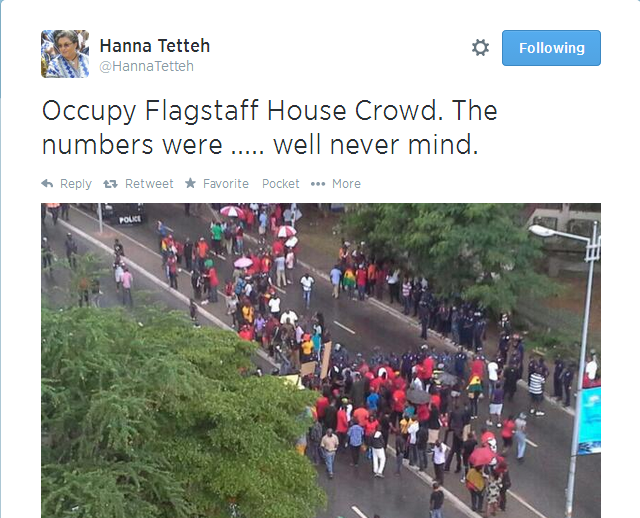 My prediction is that once smearing #OccupyFlagstaffHouse as an NPP thing doesn’t work (which it won’t), the NDC’s propaganda machinery is going to smear it as a middle class ‘dadabee’ thing. Truth be told, they would be partly right… but, if anything, that fact should actually concern them. Besides being a gauge of how bad things are (or are perceived to be), dadabee protesters make up for their lack of numbers with greater international visibility (through social media) and less likelihood of being bought off or manipulated by shows of law and authority. They also form a growing chunk of the floating voters who will sway elections one way or another. Slow claps for the organizers, who must be commended for putting the entire protest together in four or five days. Unfortunately, it meant that most of their outreach was only to those with regular access to social media. Gabriel – the taxi driver who drove me to the protest – said he hadn’t heard about it on his usual source of information (Oman FM) otherwise he might have come. It was both interesting and important to see the middle class out in force, but Nii Aryetey is right: an overemphasis on class and the ‘calibre’ of people who were there defeats the point. This movement (if that’s what it becomes) represents an important opportunity for the middle class to connect themselves to the rest of a country we are often regarded as disconnecting ourselves from. It’s one Ghana we have, and along with the death of apathy, we need to renew our empathy and respect for each other, and solidarity with each other. There’s a bunch of other things I could suggest regarding protest and demonstration tactics, but I’m going to try and communicate that to the organizers in chambers. “It’s depressing when a government feels it needs protection from its own people.” – My quote of the above piece; the Police presence was scary chale. I also didn’t like the emphasis on the class thing. It ruined it a bit for me because not all of us who come there were dadabees. I was also there when Asabee was booed at. That was a very defining moment for me at the march; it was at that moment I realized I hadn’t wasted my time. Some of the jokes and ridicule against the march on twitter also got to me bit, but I only hope that fellow Ghanaians will gradually understand the essence of such apolitical movements. NOT EVERYDAY TWEET INSULTS AT JDM, SOMETIMES COME OUT AND OCCUPY! I saw a post on Facebook by Yammin mocking the demonstration and calling it NPP organized. Our politicians are up in the clouds far removed from the realities on the ground. 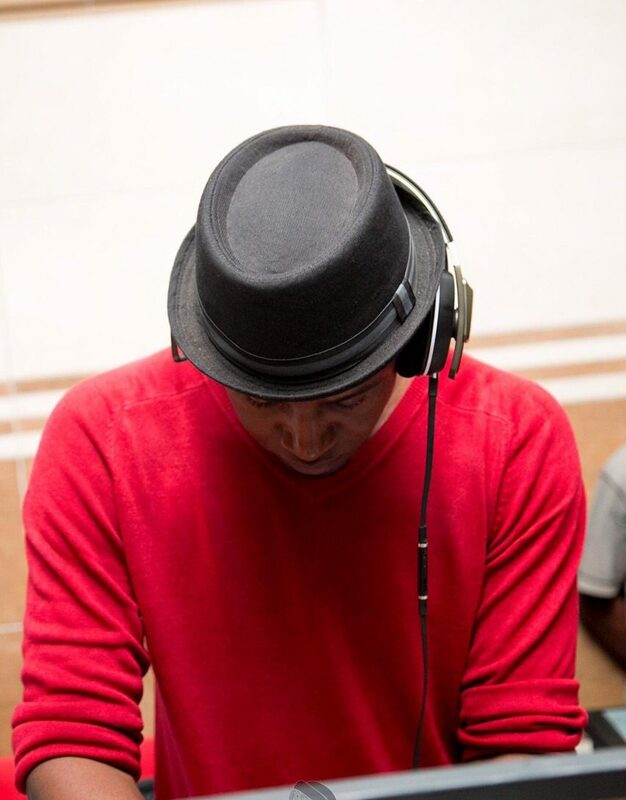 you’re a good man Kobby. Overall I’m just happy to not read about any injuries inflicted on protester’s by the armed forces. I personally felt no danger being in the midst of protesters during the Tottenham riots in 2011 but in Ghana, I fear the unpredictability of puppets armed with weapons who have a big sense of office and ego’s to match. Gives me hope. We are gradually waking up. About time too. Best piece of writing I have read from a Ghanaian blogger. Indeed it is Oman, not Aban. And oh yes the careless fixation with ‘middle class’ ‘middle class’ is prohibitively snooty.